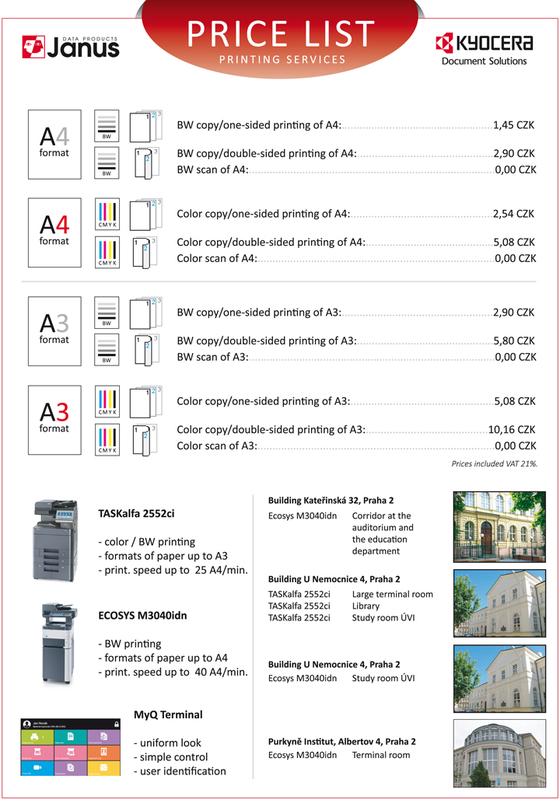 You can check or delete your print jobs in MyQ at https://myq.lf1.cuni.cz/en (using your SIS/CAS credentials). After you print your document from a PC (MyQ printer), the job is queued until you authorise it by touching your student ID to any of the connected printers. The printing is fully automated. Only the user that sent the job can authorise it an collect it. The jobs wait in the queue for the max. of 48 hours. You can print your document in a supported format (pdf, bmp, doc, docx, jfif, jpe, jpeg, jpg, mime, odp, ods, odt, png, ppt, pptx, tif, tiff, txt, xls, xlsx) directly from home or your laptop/mobile device by uploading it to the queue via https://myq.lf1.cuni.cz/en (using your SIS/CAS credentials). Note that the whole document will be printed in this way, it is not possible to limit the number of pages to print. It is, however, possible to set BW/colour, single/double page printing and a number of copies. You have to install a mobile app to your device with OS Android or Apple. To setup MyQ app automatically scan QR tag from any printer. Support PDF and JPG document only. FAT32 format is needed for trouble-free operation. It is possible to scan either directly to a connected flash drive or via e-mail set under your CAS account. If the scanned document is under 8 MB, it will be attached to the email, if it is larger, a download link will be provided instead. The unused credit can be refunded at anytime, but only until 1 month after the official termination of studies. The credit is refunded via wire transfer to a bank account after filling out a refund form. Send the printed and signed form to info@janus.cz.